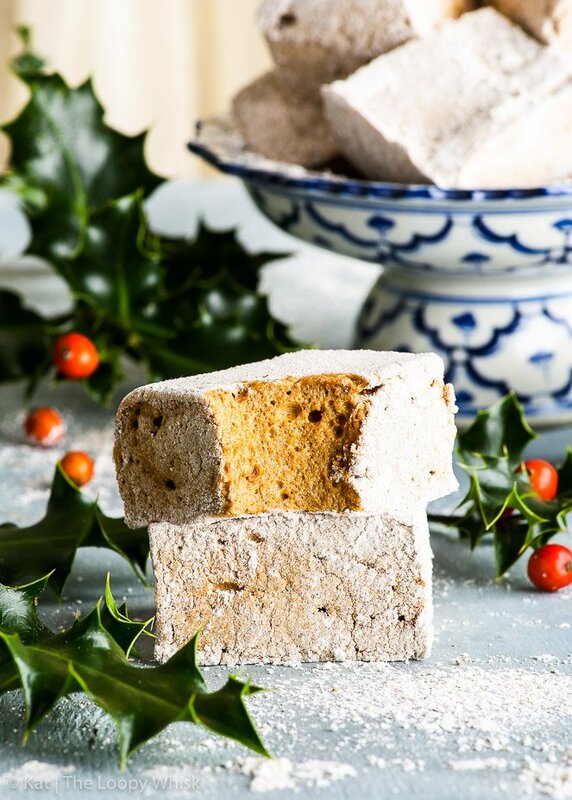 These homemade gingerbread marshmallows are a revelation. Easy to make, they truly (truly) taste just like gingerbread – there’s the molasses, the cinnamon, ginger, nutmeg and cloves. So… the taste is there, and the texture – pure marshmallowy goodness! 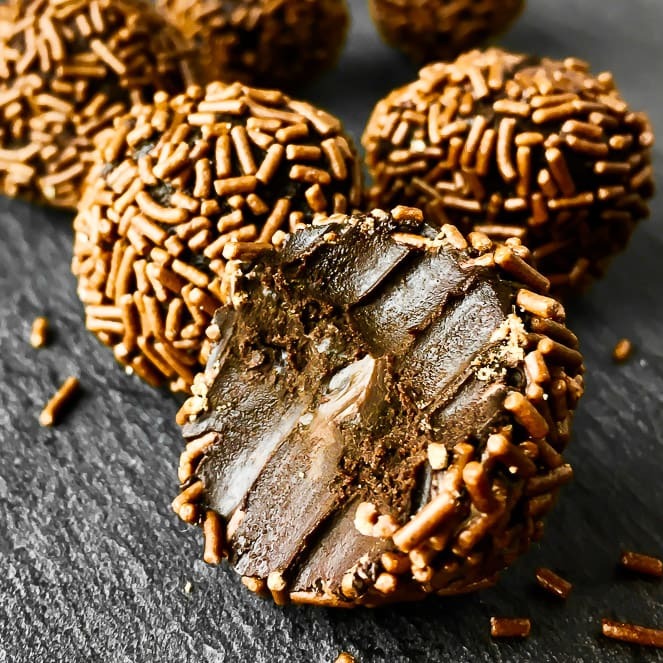 Perfect with some hot chocolate, they also make a tasty DIY Christmas gift. You know how I said I don’t trust marshmallows? Well, I’m a marshmallow convert. Now, let me clarify. I’m a homemade marshmallow convert. 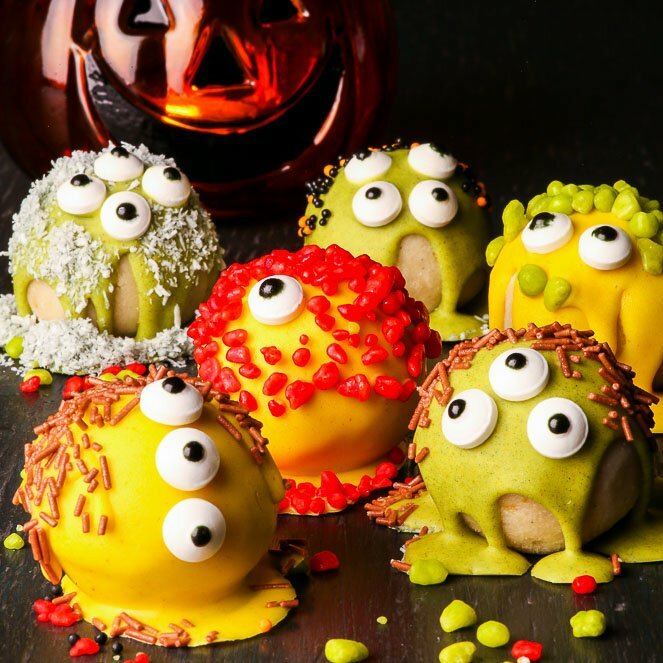 The store-bought ones still give me the heebie-jeebies… but the homemade version. HOLY. COW. They’re amazing. I love Christmas. And, as it turns out, I love gingerbread marshmallows. I’ve taken them with me to work, and WHOA. Apparently, they’re “a revelation” and the “best marshmallows ever”. I won’t disagree. It’s all true. 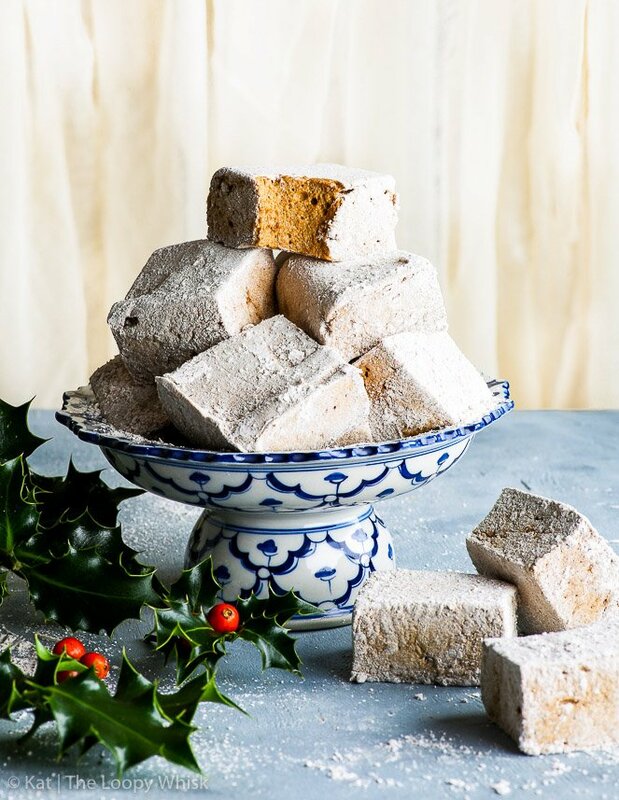 I’ve seen a fair share of gingerbread marshmallows out there – but honestly, none of them measure up to the delight that are these beauties. 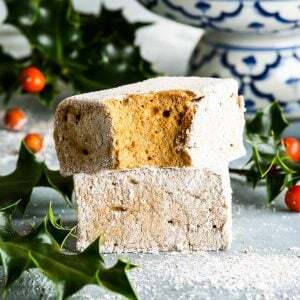 They’re not just pretend gingerbread marshmallows, with a meagre pinch of spice thrown into the mix, or – shockhorror – brown food colouring added to mimic the lovely warm brown tones of proper gingerbread. None of that stuff. Gingerbread is serious business. Also, before we start: let’s just clarify one thing. Marshmallows aren’t difficult to make. In fact, marshmallows are probably one of the easiest things to make out there. Seriously, you totally got this. So let’s get marshmallowin’. 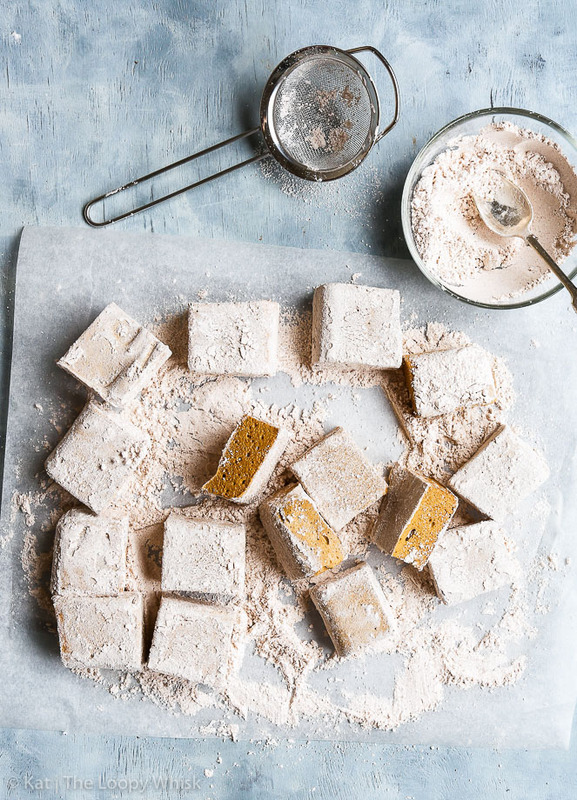 A basic marshmallow recipe, stripped to its bare essentials requires two things: gelatine (either in powder or sheet form) in some cold water, and a super hot sugar syrup. 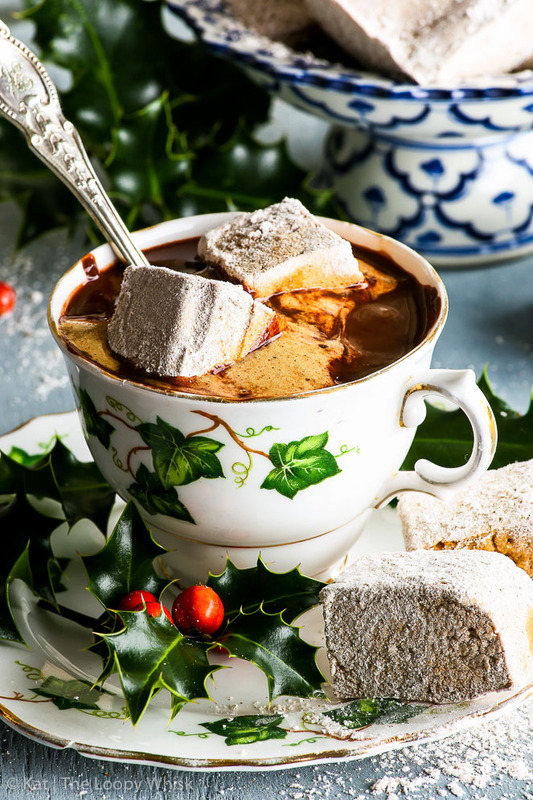 Because we’re totally feeling the Christmas vibes and we know our gingerbread, we’ll add a generous dollop of molasses to the sugar syrup. It will look waaaaay to black and icky. Just roll with it. Also, the molasses with do weird things to the sugar syrup, which will probably decide that it really wants to bubble and foam like crazy. Do yourself a favour and use a large pot. M’kay? The gelatine will do its thing in the water and then we’ll add the hot sugar syrup, which will completely dissolve any gelatine clumps. And with that, it’s over to your stand mixer. We’ll whip the murky brown weird stuff into pale golden brown fluffy submission. At this point, adding a bunch of spices is a really good idea. Think gingerbread – cinnamon, ginger, cloves, nutmeg. 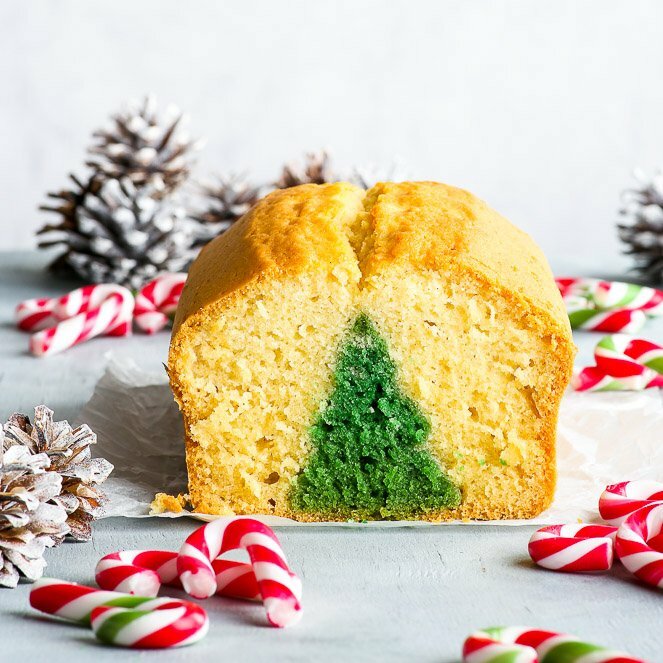 Your kitchen will smell like Santa’s factory. Play some Christmas music, get into the holiday mood. Add another pinch of cinnamon, just because. The fluffy stickiness is then poured into a well oiled baking pan and left to dry overnight. Now… please resist poking your fingers in there. Yes, it’s wobbly. Yes, it’s shiny. No, don’t poke it. See that fingerprint in the top right corner? Yeah. It’s a funny story actually. There I was, all excited because ohmygoshI’vemademarshmallows and then my mum passes by, stops and… sticks her finger into the smooth shiny perfection that was the (original) marshmallow surface. You know how you can’t look away from a car crash? Yeah. It was a slight over-reaction (we food bloggers do take our food slightly too seriously) and it all seems really funny now. But in that moment – it wasn’t. Anyway, in the long run it doesn’t really matter anyway, because the next day, a whole lot of spices, powdered sugar and cornflour is dumped on top of the marshmallows. And after turning them out onto the work surface, the other side is generously sprinkled with the same mixture. And after cutting them in regular(ish) pieces, the sides are dunked into the sweet and spicy mix, as well. Just look at that soft, airy texture. And that golden brown colour. No artificial colourings. No photo filters. Just good ol’ molasses + spices combo. Food is the best thing ever, isn’t it? 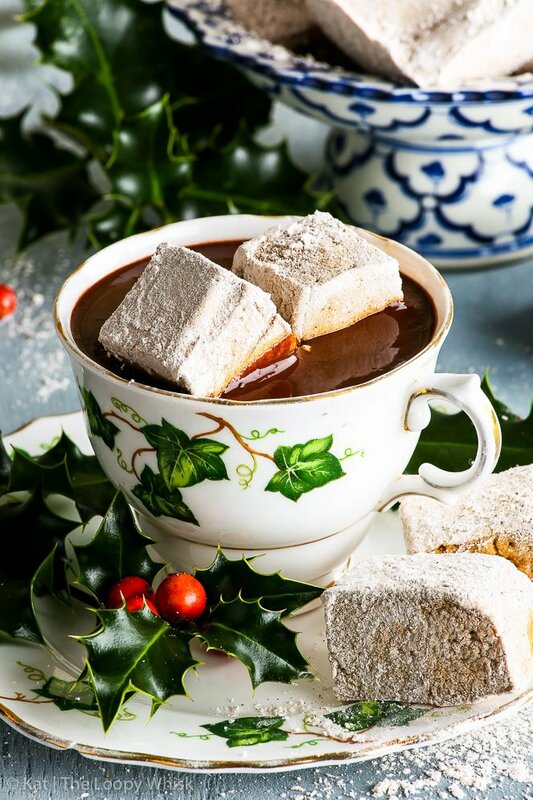 If these homemade gingerbread marshmallows aren’t enough to get you into the holiday mood, I don’t know what is. Here’s another pretty picture of pretty marshmallows on a pretty stand surrounded by pretty bunches of holly. I couldn’t help myself. I’m not sorry. Consider me a marshmallow convert. 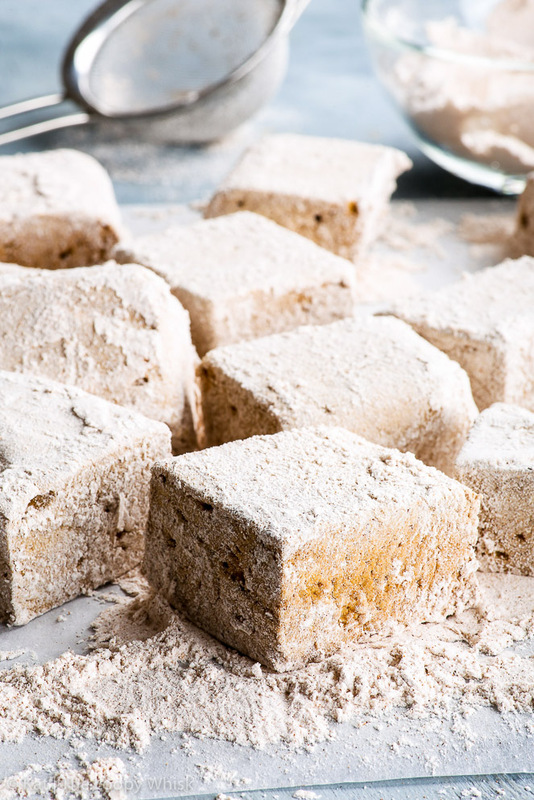 These homemade gingerbread marshmallows are a revelation. Easy to make, they truly (truly) taste just like gingerbread – there’s the molasses, the cinnamon, ginger, nutmeg and cloves. So… the taste is there, and the texture – pure marshmallowy goodness! 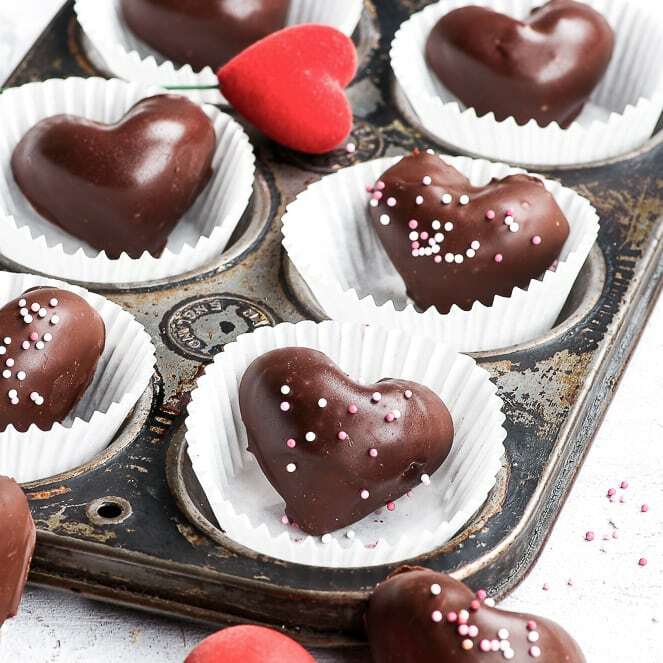 Perfect with some hot chocolate, they also make a tasty DIY Christmas gift. NOTE: The prep time doesn't include the overnight drying. Line a square/rectangular baking pan (I've used an 8 x 8 inch baking pan) with baking/greaseproof paper. Grease the baking/greaseproof paper additionally with vegetable oil. This will make removing the marshmallows from the baking pan and baking/greaseproof paper easier. In the bowl of the stand mixer, add gelatine to 1/3 cup cold water. Stir and allow to sit for 10 minutes. 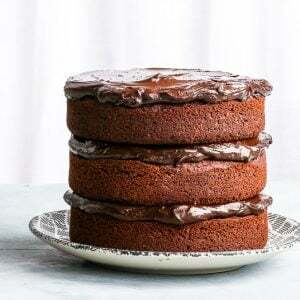 Make a hot sugar syrup from caster sugar, molasses and water, by heating them together on medium-high heat with occasional stirring until the syrup reaches about 230 - 240 ºF (110 – 115 ºC). 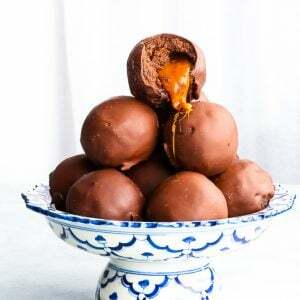 Because of the molasses, the sugar syrup can bubble and foam intensively – use a large pot! 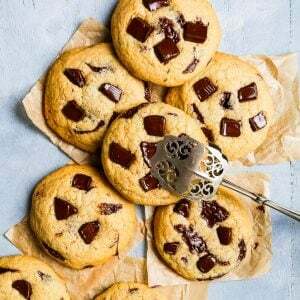 Using a stand mixer with the whisk attachment (a hand mixer with the double whisk attachment works too), whisk the marshmallow mixture on medium-high speed until it increases in volume about 3 times and it cools down to room temperature. When you lift the whisk away from the mixture, it should form soft peaks. Add the marshmallow spices and mix at high speed for 30 seconds to fully incorporate them. 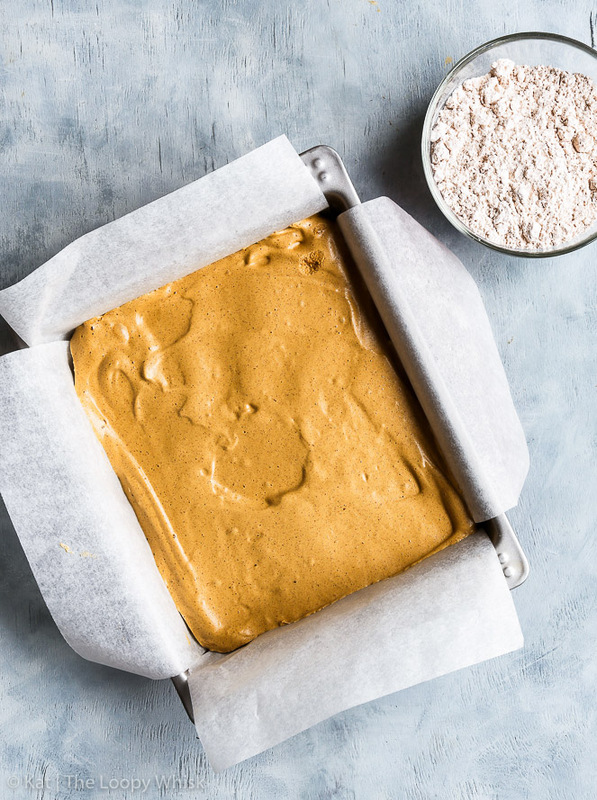 Transfer the marshmallow mixture into the lined and greased baking pan, and smooth out the top. In a bowl, mix together all spiced powdered sugar ingredients. You can sift them a couple of times to remove any clumps. Coat the top of the marshmallow mixture (while still in the baking pan) generously with the spiced powdered sugar. 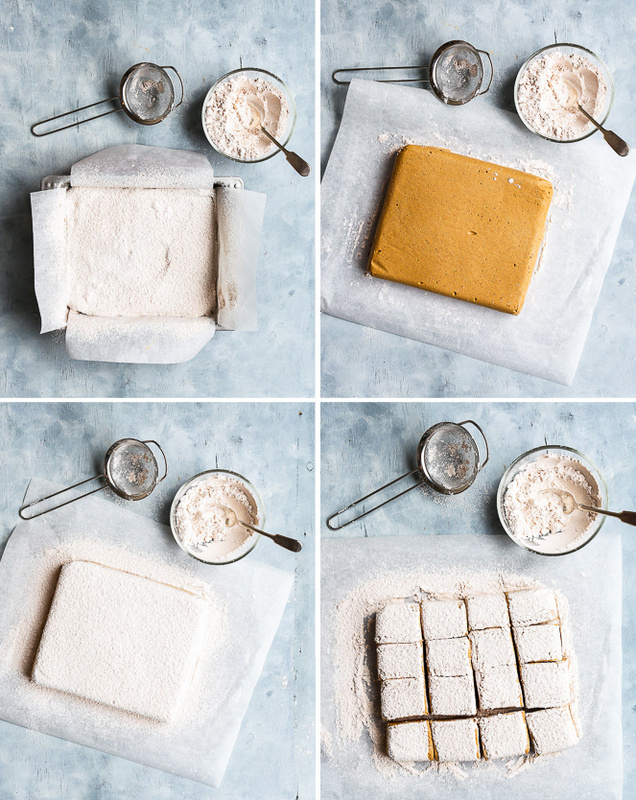 Turn the marshmallow mixture onto a clean greaseproof/baking paper and coat the other side of the marshmallow "block" with spiced powdered sugar. Cut the marshmallow "block" into regularly size pieces. Roll the pieces in more spiced powdered sugar to ensure they are evenly covered. 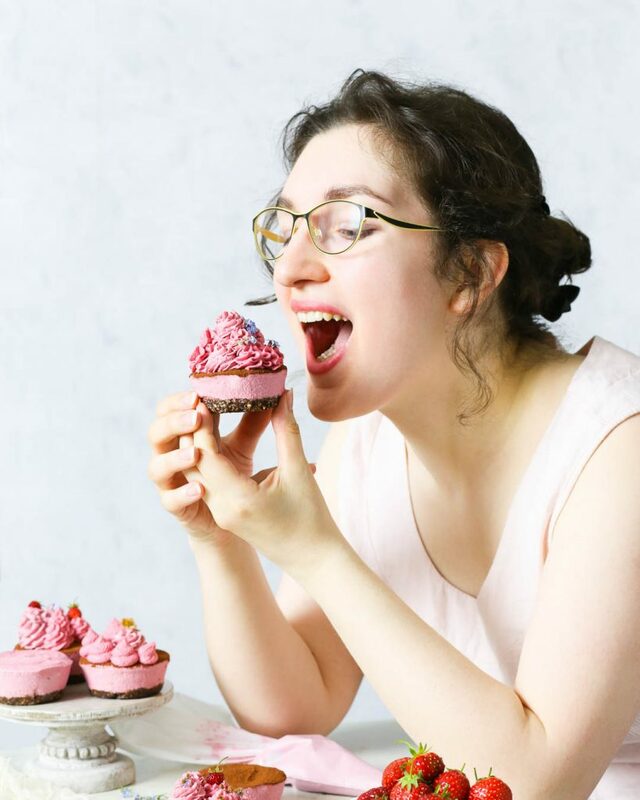 Looking for more sweet deliciousness? Well, look no further! Wow! These look SO good! I’m a giant fan of marshmellows and always keep a bag (hidden) in the house to grab one (or three) every so often. But these look way better than store bought!! Putting it on my “to make” list! I follow you on instagram and love your stuff! Yay! Thank you so much, Sarah – I hope you make and love the marshmallows, they’re a favourite of mine! Hi, can this be piped into shapes?